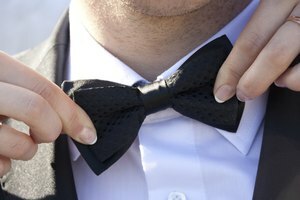 White tie, black tie, formal, semi-formal, cocktail—dress codes can be confusing. Of course, everyone wants to respect the host's wishes. Here's how to decode the dress code. White tie is the dressiest and strictest of all. Galas, charity balls and some weddings may call for white tie. Ladies should wear their fanciest floor-length evening gown. Embellishments like beading and sequins add drama. Accessorize with statement costume or fine jewelry. Shoes must be a pump or evening sandal with a heel. Gloves are optional. Men are expected to wear a black tuxedo jacket with tails, matching trousers, a white, spread-collar shirt and waistcoat. A black or white bow tie is a must, and gloves are optional. Shoes should be black patent leather cap toe or wing tips. Black tie is also formal, but with just a little more flexibility. These days, women aren't required to wear a floor-length gown, but it still the traditional attire. Fancy dresses that fall between knee and mid-calf length are acceptable. Choose luxurious fabrics or embellishments to dress up a shorter hemline. High heels are essential, and jewelry adds elegance. Guys must still wear a black tuxedo and white collared shirt but can forgo the waistcoat for a cummerbund. A long tie and bow tie are suitable but should be black to match. Shoes should be black patent leather cap toe or wing tips. Suspenders and cuff links are optional accessories. Semi-formal attire for evening events like weddings can also sometimes say black tie optional. This leaves certain details at the discretion of guests, like whether to wear a long or cocktail-length dress, or sport a suit or tuxedo. Ladies can opt for an evening gown or cocktail dress, and heels are a must. For short dresses, consider metallic hues or rich fabrics like brocade to boost glamour. With a long evening gown, keep the accessories minimal. In lieu of a tux, a two- or three-piece suit in black or navy works. Ties should be conservative and matching with the suit. Shoes should be black patent or leather oxfords. Semi-formal occasions range from cocktail parties to corporate events and holiday gatherings. Ladies can go for anything from a little black dress to fancy separates like androgynous tuxedo pants and a sequined blouse. Pumps are a sure choice, but shiny or embellished flats are fine, too. Guys should wear their highest quality business suit with a dark silk or knit tie. A white dress shirt is still the standard. A vest is optional. Shoes can be black or brown leather oxfords; they should match the leather of the belt.